We’d like to take a bit of credit for jumping on the Brandt Snedeker bandwagon even before he won this past week at Pebble Beach, or prior to his second runner-up finish at the Waste Management Phoenix Open. Sure, Snedeker won the 2012 FedEx Cup, but even that win didn’t seem to put him on the map in terms of the top players in the game. But Snedeker has certainly been the most exciting player to watch through the first two months of the PGA Tour season, with one win, two runner-ups, and a third place already in just five total starts on the season. But what’s lacking in Snedeker’s trophy case is a Major championship. You know, that statistic for which all golfers in history are measured? Yes, that one. It’s not as if Snedeker busted onto the scene in 2012, he has been contending for years before that. He has five total wins on the PGA Tour, and came ever-so-close to winning the Masters back in 2008. So much so that he couldn’t help by be overcome with emotion following his round on Sunday. But the 2013 version of Snedeker seems different somehow. He seems more calm, cool, and collected. In other words, he seems more confident that he can go out and beat the best in the world. Snedeker has risen to the No.4 ranked player in the world on the latest golf rankings, behind Rory McIlroy, Tiger Woods, and Luke Donald. His win at Pebble Beach has certainly put the golfing world on notice that he could be the player to watch in 2013. Sure, it’s certainly early in the calendar, but you can’t overlook the top-notch consistent performances that he has strung together. We picked Snedeker to win at Pebble Beach, and now we are going to take that even a step further and predict that Snedeker will win a Major championship in 2013. He will have a great shot to do it at Augusta in April, where he has had previous success. But we think his second-beat chance might be at Oak Hill in August for the playing of the PGA Championship in New York. We will have to wait some time on these predictions, but we will definitely be coming back to them if it pans out. This entry was posted in Opinion and tagged 2013 masters, 2013 pga championship, brandt snedeker, luke donald, pga tour, rory mcilroy, tiger woods, world golf rankings on February 13, 2013 by Bryan. 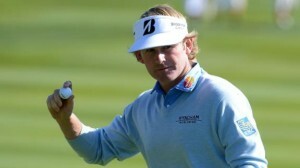 Why is Snedeker not in the Accenture Match Play? David, thanks for the question. Unfortunately Snedeker withdrew citing a minor rib injury that he has been dealing with since the Humana Challenge so he elected to take some time off. As for Mickelson, he said that because his kids have some time off from school, he will be taking a family vacation and skipping the event. Both have played a significant amount this season so far, but it’s a shame that two winners in 2013 will be out, especially when Snedeker would have been a No.1 seed.